Renting Art is an Excellent Option! 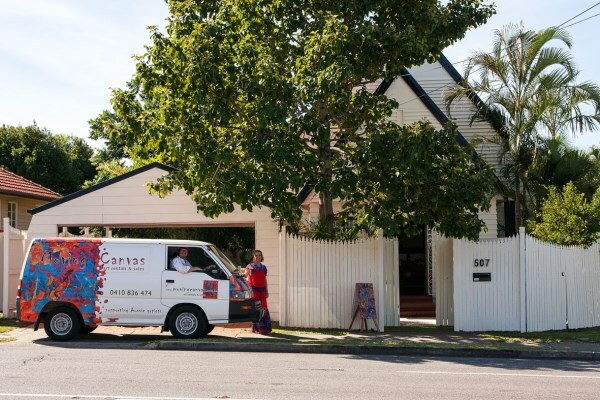 Moving Canvas Art Rentals and Sales is a Brisbane Art Gallery, offering a wide selection of original art for rent or sale. Our Gallery is housed in a gorgeous former church of the Nazarene’s, located at 507 Stafford Road, Stafford and is just 8kms north of Brisbane CBD. The best parking with no restrictions is in Grice Street, just a minute walk. 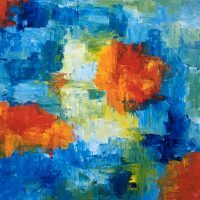 We offer a good range of colourful, original art styles on canvas (no glass-framed prints), from abstract to traditional. There are no long-term contracts. After the first agreed term (minimum of a month), the rental period can be extended week by week as required. We offer on-going rental terms for the office, foyer or boardroom, and short-term leasing for residential interior property styling or home staging. Good art on office walls helps to elevate your client’s perception of your business (or home), thereby giving clients a good feeling about doing business with you. They’ll probably tell others about you. Artwork elegantly completes corporate fit-outs, interior design or refurbishments, and improves the selling potential of your home when it comes time to sell. Home owners and Property Stylists all welcome. Art rental is especially relevant to Residential Stylists, Home Staging, Interior Decorators and Architects, and is a great resource for film Set Designers, Art Directors and TV Production Companies. Moving Canvas also supplies printing and framing services to hotels, apartment blocks, cruise ships and offices etc., for guest rooms, corridors and lobbies. Moving Canvas offers Curatorial Consultancy to businesses and home owners to arrange artwork on office walls for the best aesthetic effect. In addition, Moving Canvas specialises in high quality site-specific art commissions for Companies. The Company logo can be subtly incorporated into the artwork for a unique corporate image for the foyer or boardroom. We respond professionally with two to three concept sketches and a quote, and deliver on time. Gift certificates are available so that clients or friends may choose their own art. Art is an ideal gift for the corporate and private individual. Occasions such as welcoming your new CEO, thanking a great employee, a wedding gift, birthday, anniversary or special occasions. Moving Canvas is proudly Australian owned. It has been shown that art on Office walls reduces stress in workers, and encourages right brain activity through visual stimulation. Great art on walls improves staff moral and therefore, increases productivity. Consequently, office art is good for business and your shareholders. Art relaxes and invigorates with equal measure. Art stimulates the senses, and provokes and pacifies. It introduces new ideas and encourages debate, thus it opens our eyes to what is around us. Art show us what is possible and inspires us to try. Art exercises the mind by connecting synapses. It brings people together through lively debate. Art is good for the mind, heart and soul. In short, art is good for our health and has no known harmful side-effects. Location: Moving Canvas Art Gallery and Banx Studio. 507 Stafford Road, Stafford, Brisbane 4053, Queensland. Parking: Grice Street, just one minute away with no restrictions. Opening hours: We are happy to make an appointment to visit you at work or home. Or make an appointment to come and visit us. *Delivery charges apply for small orders (under $400) and outside Brisbane. 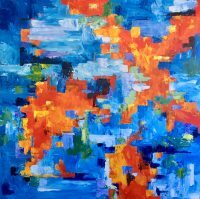 By renting or buying Australian art, you support Australian artists.